Rustic colors are totally in trend this June 2014 especially in the wedding scene! 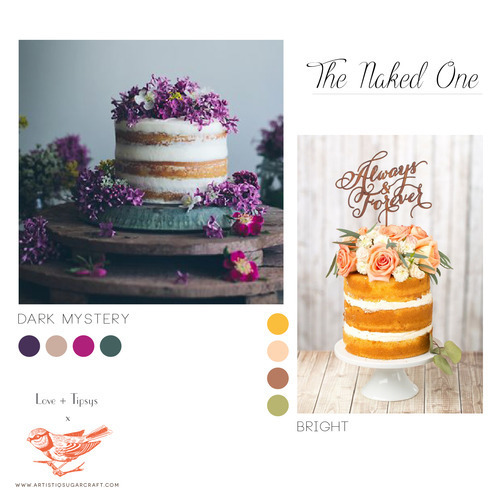 So if you’re making a wedding cake for anyone – here’s some lovely cake color trends and inspirations to share from what i’ve snooped and gathered on the web! I think it’s easy to go “wrong” whilst creating a rustic looking cake as you would need to strike a perfect balance between creating rawness without it losing it’s grand appeal. Most rustic cake images i’ve seen look sloppy and untidy or even undone. Additionally, For some reason, ( perhaps because people like to stick to the – i am in the woods – let’s pluck some flowers and throw it on a cake idea ) most rustic cakes are adorned with real flowers. Well, maybe i’m a tad bit bias, but i really wouldn’t use fresh flowers on a cake especially when the sugarflower artist at home is such a perfectionist with sugar flowers! Anyway, here are some good examples of a well balanced rustic cake according to my trained designer eye at least! If you’ll like to bear it all in the misty woods, contrast would play a part in making it pop! Choose to either go dark or light with colors if you are keen on this idea. Slap on buttercream or even a dose of jam in between the tiers and decorate! – Keep a look out on tomorrow’s post continuation with more rustic inspired ideas! This entry was posted in Baking, Cake, Decoration, Inspiration. Bookmark the permalink.